Having pioneered super-efficient ‘dynamic’ balancing valves, which can cut pump energy costs by up to 50%, Frese is now launching the Frese STBV Fixed Orifice Double Regulating Valve. 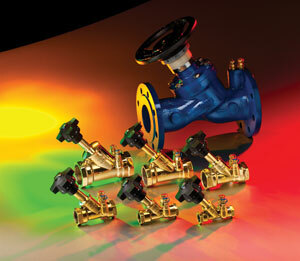 According to Managing Director, Stephen Hart, it makes sense for Frese to turn its exper-tise to manual valves. “For a long time we have focused on our innovative Pressure Independent Flow and Temperature Control Valves, and they have now become the standard,” he said. “They deliver great benefits in terms of efficiency and savings at the construction stage and for Facilities Managers, but we also understand that there are still some applications for which a manually balanced valve is an acceptable alternative and that’s why we’ve developed this new valve. The new valve will offer a number of benefits from being simple to install and adjust, having a clear two digit pre-setting scale and delivering accurate control at all flow settings. The valve will be available in a range of sizes from DN15 to DN300 and has features such as built in PT ports for flow measurement and a double regulating feature to enables the vale opening to be set at the desired point with an Allen key.